We must recognize the difference between burdens that are right for us to bear and burdens that are wrong. We should never bear the burdens of sin or doubt, but there are some burdens placed on us by God which He does not intend to lift off. God wants us to roll them back on Him— to literally “cast your burden,” which He has given you, “on the Lord….” If we set out to serve God and do His work but get out of touch with Him, the sense of responsibility we feel will be overwhelming and defeating. But if we will only roll back on God the burdens He has placed on us, He will take away that immense feeling of responsibility, replacing it with an awareness and understanding of Himself and His presence. 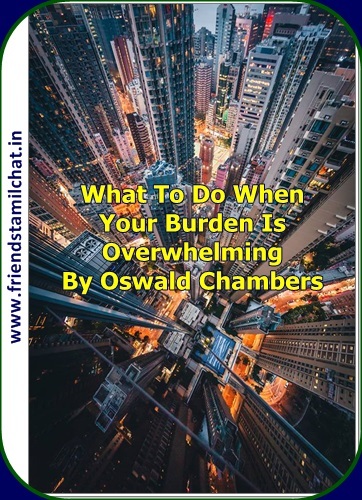 “Cast your burden on the Lord….” You have been bearing it all, but you need to deliberately place one end on God’s shoulder. “…the government will be upon His shoulder” (Isaiah 9:6). Commit to God whatever burden He has placed on you. Don’t just cast it aside, but put it over onto Him and place yourself there with it. You will see that your burden is then lightened by the sense of companionship. But you should never try to separate yourself from your burden.